After flaming out in the GOP presidential primary — and enduring rival Donald Trump's taunts along the way — Sen. Marco Rubio is entering his next act in politics. The once-rising star used to be criticized for being in too much of a hurry, but now he's hunkered down in the Senate with nothing, it seems, but time. Rubio passes his days buried in the work of the Senate Intelligence Committee and is a leading advocate of bolstering election security and slapping sanctions on Russians if they interfere again in 2018. In the hallways of the Capitol, he brushes past reporters looking for reaction to the news of the day, focusing instead on legislative proposals or policy speeches on the Senate floor. And back in Florida, he's involved in long-running disputes over the Everglades and toxic algae blooms. But one thing Rubio isn't doing, he says, is gearing up for a White House run in 2020. [post_ads]"I'm not primarying the president, and no one else should either unless we want to lose the White House," Rubio told The Associated Press. "I'm kind of approaching every day as if the U.S. Senate is the last place I'll ever serve in public office and trying to make that meaningful." Like the other Capitol Hill also-rans against Trump — Sens. Rand Paul and Ted Cruz — Rubio is finding his way in the Trump-era Republican Party, testing whether there is room for his own brand of conservatism. He says he keeps in contact with Trump, talking to him on the phone two to three times a month, including last week. But he is continuing to reshape his own political identity, separate from the president, and isn't ruling out another White House run somewhere down the line. "I still peek around the corner every now and then, but by and large I try to be more and more focused on what's in front of us," Rubio said. He added that he remains "impatient," but "like anyone who is alive, and is watching, listening and trying to learn, time teaches you things." After he ended his 2016 presidential campaign, Rubio appeared to be on his way out of Washington. He had pledged not to run for re-election, but colleagues pressed him to reconsider. Sen. Bob Corker of Tennessee, the chairman of the Foreign Relations Committee, told the AP he was among the first Republicans to nudge Rubio to seek re-election to the Senate. Senate Majority Leader Mitch McConnell made his own pitch as Republicans fought to keep the Senate majority. Eventually Rubio agreed. Since then, people who have observed Rubio during his career see a more mindful, even liberated, politician who no longer carries the weight of being "The Republican Savior," as Time magazine once called the charismatic young son of immigrants. Instead, the 47-year-old is keeping his head down and doing the grunt work of governing, answering head-on the criticism that he was more flash than substance as a candidate. "He seems to have found his place," said longtime ally Nick Iarossi, a Florida-based GOP lobbyist and fundraiser. On several fronts this year, Rubio has started taking his shots to "modernize" the GOP agenda for the 21st century, as he puts it, with an emphasis on countering China abroad and helping working families at home. In the spring, Rubio helped lead an effort to rein in the Chinese telecom giant ZTE for violating U.S. trade rules over selling goods to Iran and North Korea. He sought to impose stiffer penalties than the Trump administration wanted. The Senate approved the bipartisan effort, but Rubio ultimately lost that battle with the White House, as the legislative provision was abandoned. Earlier this month, Rubio unveiled a family leave plan, after having successfully worked with Ivanka Trump to expand child tax credits in the 2017 GOP tax overhaul. The paid leave plan would allow young parents to take their Social Security funds early, to help pay for time off with children, rather than in retirement. Both ideas had been part of his presidential bid. "His distance from the middle of the political firestorm," said Rubio's former campaign manager and top adviser Terry Sullivan, "has allowed him the space to practice his style of politics." But mention of Rubio still draws a collective eye roll from some critics who see just another survival strategy after the brutal presidential campaign. He's doing what Rubio often does, they say, which is trying to chart a middle ground that often pleases no one. 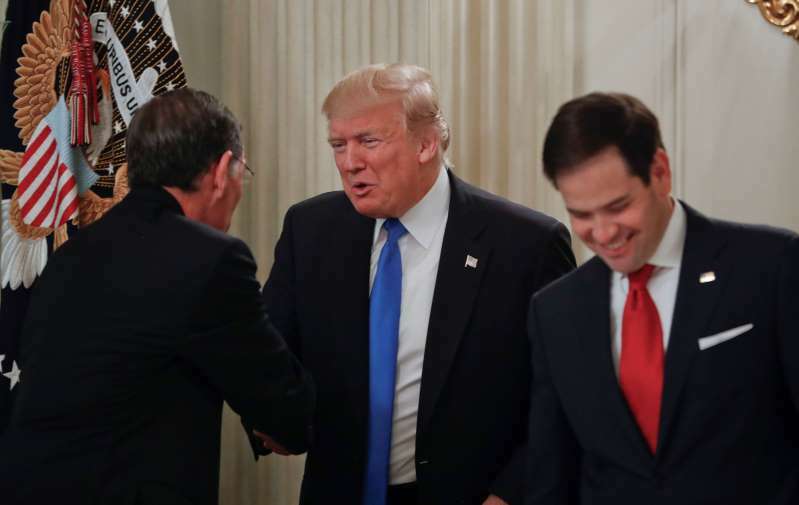 Jesse Ferguson, a former adviser to Hillary Clinton, said the idea that Rubio is emerging as some independent Republican voice "is indicative of the way Trump has turned Congress into a bunch of yes-men." "In the GOP today, showing independence from Trump is like being awarded valedictorian at summer school," he said. "The bar is so low that any Republican that doesn't salute, praise or genuflect any time he walks in the room is suddenly seen as a thoughtful, independent-minded leader." It's also not clear that there's space for Rubio's brand of conservatism in the GOP's Trump tent. Despite his roots as a tea-party-backed candidate in 2010, Rubio always played better to suburban voters — the Starbucks moms and dads whose households look a lot like his, with kids, mortgages and college costs in the distance. It's those same voters who are at risk of fleeing the GOP in the Trump era. Jenny Beth Martin, of the Tea Party Patriots, surveyed several hundred members at the start of this year and found a mixed response to Rubio. "It really went the whole spectrum from excellent to ho-hum to disappointing," she said. "They just cannot figure out exactly what issues are driving him the most and how they align with the tea party values or President Trump's agenda." Rubio, for his part, tweets Bible verses many mornings, which some see as an antidote to Twitter's usual rants, and he is perhaps the only rank-and-file lawmaker to be guarded by a security detail after it was reported there was a possible threat on his life. He expects the nation's political pendulum to swing back his way eventually. Americans will one day grow exhausted of the current "outrage cycle and the constant fighting," he says. "Because if it doesn't, we're in a lot of trouble."